Montegrappa’s limited editions are conceived to provide their discerning owners with a taste of Italy, to feel the presence of the great masters who passionately breathed life into their works and made them immortal. Among the limited edition series produced by Montegrappa is a brand-new Collection named Mightier Than the Sword, joining the Cult and Icon collections in honouring individuals of great cultural impact and influence. As the name implies, by glorifying the pen and the written word, the candidate is a special person who has enriched and enhanced life by contributing to mankind through philosophy, politics, the arts and other fields. Prominent among the subjects of the Mightier Than the Sword Collection will be writers, politicians, national heroes and other notables. 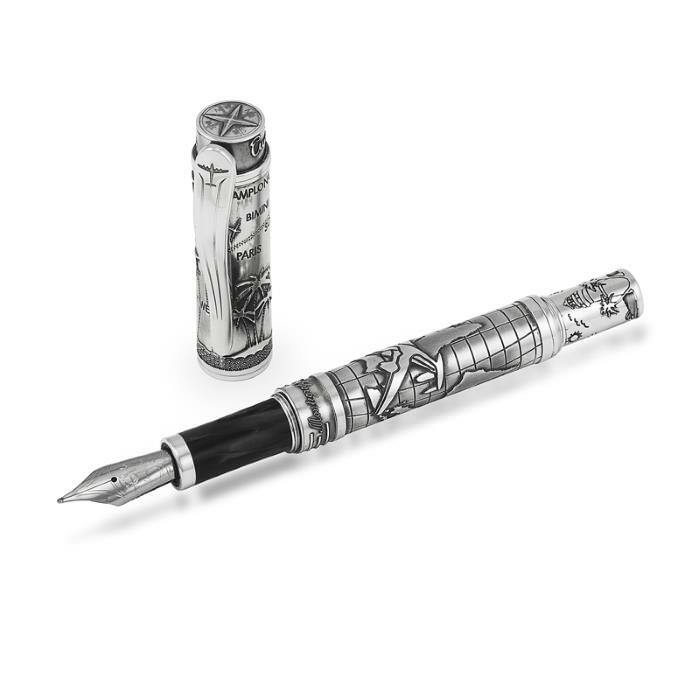 It is therefore appropriate that The Hemingway Pens form the first family in this new series.Ernest Hemingway was one of the most innovative and influential writers, reporter and novelists of the 20th century, one who wrote, coincidentally, with Montegrappa pens. The Hemingway Collection is divided into four “chapters”: “The Soldier”, “The Writer”, “The Fisherman” and “The Traveller”. Each of these chapters of his life is embodied in a pen, offered in the three types: fountain, rollerball and ballpoint pens. In keeping with the accoutrements of the era, the packaging itself has been inspired by the notebooks used by reporters during the First World War. Each model in the four topics is a limited edition of 100 examples. All pens in the series will be produced in celluloid with sterling silver trim or entirely in sterling silver. 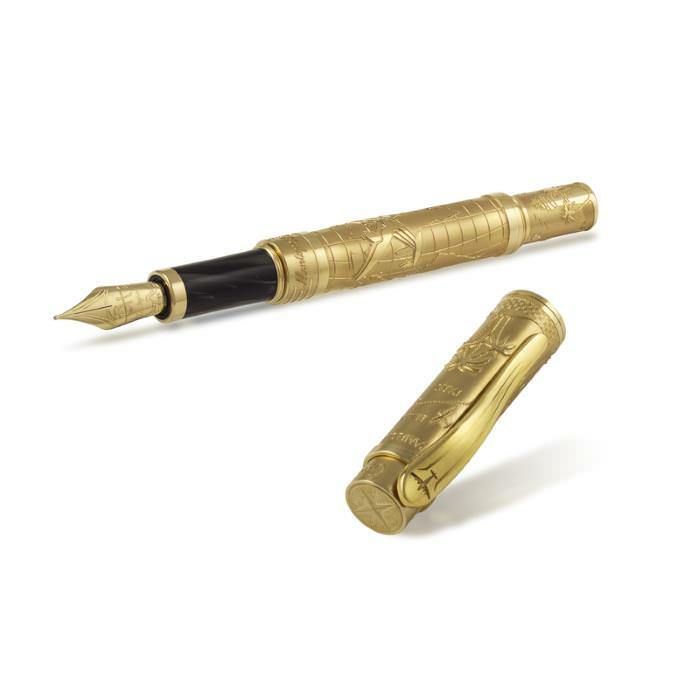 In addition to the silver editions, 10 examples of each of the three pen types, in each of the four chapters, are trimmed with 18k gold. All invoke the spirit of the writer who single-handedly transformed modern writing. Wanderlust was in Hemingway’s blood, this inveterate traveller closely associated with a number of locations from Spain to Italy, Paris to the Florida Keys. Evoking the spirit of the voyage, The Traveller in Sterling Silver and Charcoal Black celluloid, is adorned with airplanes, maps and passports, with 11 of his associated locations highlighted. It is reminiscent of the era when travel was an adventure, the symbolism of the design showing the “starting” airport is the nearest airport to his birthplace while the other is the nearest airport to his place of death. A compass resides on the cap top, a repeating airplane motif dresses the clip and barrel, a sea light tower features on the barrel end and a boat steering wheel is positioned centrally.